In the fall of 1995, I was browsing at a local pet store that had a rather large selection of reptiles (for small town in Mississippi, that is). There were iguanas, bearded dragons, various common geckos, savannah monitors and large constrictors, but one lizard seemed to beg for my attention. It literally came to the front of the enclosure as if to say, "Please buy me." It was an interesting lizard, with a roosterlike crest, half inch spines running from the top of the head to almost the end of the stub tail, big eyes and puffy jowls. This was the first time I'd ever seen the magnificent Asian water dragon (Physignathus cocincinus). The lizard's color was a light olive green with hints of emerald and blue. It was an adult male that was stunted from being raised in too small an enclosure. I did not purchase the dragon at that time, however; I already had a 3 1/2-foot green iguana that was becoming quite the handful. A couple of months later, while opening Christmas presents, I began to shake a box that I was just handed. "Don't shake that one!" yelped my mother. And that was I received my first water dragon. Now named Ziggy, he was the exact dragon that I saw at the pet shop. My mother had been secretly keeping him at her apartment for 2 weeks. Now I was faced with the task of properly feeding and housing my new friend. I quickly acquired every book I could find and read them from cover to cover, more than once. Physignathus cocincinus hails from the dense forests of Indonesia, Vietnam, Thailand and South China. Commonly called the Asian water dragon, it's also known as the Chinese or green water dragon (aptly so, as the normally imported specimens are very green indeed). 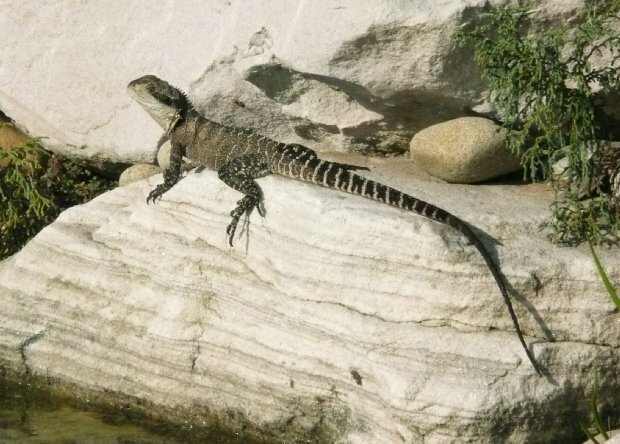 Asian water dragons can reach a length of 24 inches in one year when raised properly, to a total length of approximately 36 inches (this being mostly tail). They react to stress and cool temperatures by darkening their colors, and they can turn almost black when seriously stressed. They can live 10 to 12 years. Crickets, mealworms, super worms, wax worms, earth worms, and high-grade canned chicken cat food (make sure there's real chicken in it) are all relished. My adult lizards love chicken cat food; most juveniles will only eat insects. Recently, I have experienced great success with fruit-flavored dry lizard and bird pellets. I recommend supplementing the diet with either of these. Red and white grapes, soft pears, figs (native fruit for them) and bananas make up the noninsect portion of my dragon's food pyramid. I alternate these food items to achieve a balanced variety. All foods should be pesticide free. Feed your dragons each day, though missing a day won't cause any harm. Dust crickets two or three times weekly with top-quality vitamin and mineral supplements that are high in calcium. Gut-loading crickets or worms by feeding them a commercial gut-loading formula or a mash of assorted vegetables an hour before offering them to your dragons will ensure happy, healthy dragons. After 60 to 65 days, you should have 6-inch water dragons hatching out. Place them in their own enclosure and offer them small amounts of quarter-inch crickets twice daily. Place some pelleted lizard food (iguana food works fine) in the enclosure so stray crickets have something to eat, but don't put in so many crickets that many go uneaten. Mist young dragons daily, and provide them with vertical and horizontal climbing perches. I hope this article helps everyone interested in the care and breeding of these fantastic pet dragons! Good luck if you decide to try breeding them yourself - the results are well worth the effort! Mike Spears is the owner of Sapphire Dragon Ranch and has kept many different types of herps over the past 25 years. He began working with them professionally in 1995. A glimpse to the Water Dragons world truly captures the heart.